Q: The trade war waged by the United Stated has caused widespread worries among the international community. Major economies, well-known international organizations and many transnational companies have expressed strong concerns over that. From China's perspective, how is this trade war going to impact the world economy? First, the trade war dampens the growth momentum of global trade. An IMF research shows that tariffs or other barriers will lead to a 10% hike in import prices for all countries and a 15% fall in global trade in another five years' time. The World Bank found that the tariffs increase by the US and its major trade partners will lead to a drop in global trade flows equal to the amount that took place during the financial crisis of 2008-2009. Second, the trade war shakes everyone's confidence in the world economy. IMF Managing Director Christine Lagarde said that "the clouds on the horizon are getting darker by the day, and the biggest and darkest cloud that we see is the deterioration in confidence". Flicking through recent newspapers of many countries, you cannot help but feel that the escalating trade war has become the biggest "confidence killer" of the world economy, which will damage the hard-won momentum for recovery and destabilize the foundation of global economic growth. The Organization for Economic Cooperation and Development (OECD) predicts that with the increase of tariffs, global economic growth rate will fall by 1.4 percentage point. Third, the trade war jeopardizes the well-being of all mankind. World Trade Organization (WTO) Director General Roberto Azevedo said that trade wars are detrimental to everyone and jobs will be severely affected. The poor will lose about 63 percent of their purchasing power. American economic institutions also predicted a loss of 600,000 jobs due to the trade war, with US workers, farmers and consumers being caught in the crosshairs. Last but not least, initiating a trade war to serve domestic political needs and selfish interests is a typical act of unilateralism and zero-sum game. It marks a full-blown regression of international rules and global governance since the end of the Second World War, which, if unchecked, will cut so deep to the world economy that everybody should be alarmed by this. Q: How will China be hurt by the trade war? Is China's economy strong enough to withstand the trade war? A: This question has already been answered by the officials from the Information Office of the State Council and the National Development and Reform Commission (NDRC) in their press briefings. Our strong domestic demand is our powerful backup. We have the confidence, the abilities and the conditions to realize steady and sound economic growth. Follow-up: So just now you were raising the alarm about the danger to global trade, but you believe that China will not be affected? A: I don't see any contradiction in these two. No one wants to see a trade war. Just like I said, a trade war will damp the growth of global trade, shake the confidence of all in the world economy, jeopardize the well-being of all mankind, and undermine global governance and international rules. Of course we don't welcome a trade war in which everyone loses. In the meantime, as has been made clear by the Spokesperson of the Commerce Ministry and officials from the NDRC, the Chinese government is confident that it has sufficient abilities and enough leeway policy-wise to take targeted measures, ease the impact of the China-US trade frictions, absorb the impact of the world economic uncertainty, and uphold China's legitimate interests. Q: The US White House website put up a speech made by Vice President Mike Pence. He said that across every industry, China's average tariffs on American goods are three times higher than the US tariffs on Chinese goods. The US will take strong action to prevent China from stealing technologies. If China refuses to level the playing field and continues to retaliate against the US, the US will not back down. What is your response? A: The statement made by our Commerce Ministry has comprehensively and clearly explained China's position on the relevant issue. Since the US officials want to talk about tariffs, fairness, "stealing" and retaliation, then I can say a few points on them. First, is it true that across every industry, China's average tariffs on American goods are three times higher than the US tariffs on Chinese goods? Not true! Take automobile tariffs for example, the US may have a 2.5% tariff rate on imported passenger vehicles, but it imposes a 25% rate on imported trucks. But China has recently reduced its tariff rate for imported auto parts to 6% from 10%. Second, is it true that China refuses to level the playing field? Not true! China always upholds fair trade, but fairness is not to be defined by one party alone who only thinks about its own interests and needs in rules-making. China is in the process of a new round of opening-up. We will continue to work for an open, transparent, fair and predictable business environment. The US, on the other hand, has been engineering all kinds of excuses, including preposterous and far-fetched ones like "national security", to obstruct and restrict Chinese enterprises' normal investment and business activities in the US. China's door is opening wider while the American one is closing down. Who is doing the right thing here? I believe it is not that difficult to answer. Third, is it true that China is stealing the US intellectual property? Not true! The US has severely distorted what happened in the past and is happening right now by accusing China of stealing intellectual property. China is pursuing innovation-driven development. Every innovative achievement we have today is made through our 1.3 billion people's wisdom and hard-work, not by stealing or robbing. Former US Treasury Secretary Larry Summers got it right when he said that Chinese companies' leadership in some technologies is not the result of theft from the US. It's coming from terrific scientists in basic science. It's coming from an educational system that's privileging excellence and concentrating on science. For those egotistical men in the US, I strongly recommend Joseph Needham's Science and Civilization in China for them. Fourth, is it true that if China continues to retaliate, the US will not back down? Not true! The correct way to put this is that if the US is bent on having everything its way, then it needs to ready itself for more forceful fight-back from others. The US initiated this war of unilateralism, protectionism and power politics against multilateralism, free trade and rules-based order, but the international community is united and determined in upholding their legitimate rights and interests and maintaining the multilateral trading rules and system. The US believes that as a hegemon, it can hit whoever it wants and others have no reason whatsoever to defend itself. If the US clings to this logic, it is destined to travel alone and go further and further down the erroneous path. Q: Tomorrow, President Xi Jinping will start his visits to the relevant countries in the Middle East and Africa. Could you give us more details on the agenda of the visits? During the visits, President Xi will also attend the BRICS Summit. Will the US trade policy be discussed at the summit? 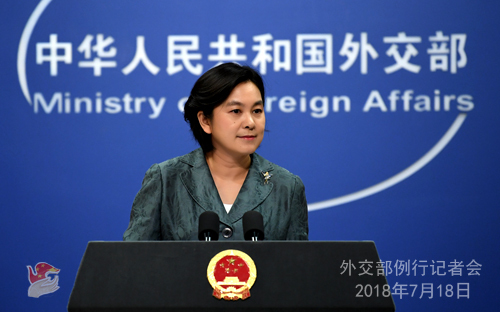 A: On July 13, the Foreign Ministry already held a briefing on President Xi Jinping's upcoming visits to the five countries in Asia and Africa and his attendance at the 10th BRICS Summit, during which Vice Foreign Minister Kong Xuanyou and Assistant Minister Zhang Jun talked about the relevant issues in details. You may refer to that. The theme of the BRICS Johannesburg Summit is "BRICS in Africa: Collaboration for Inclusive Growth and Shared Prosperity in the 4th Industrial Revolution". We hope to work with South Africa and other relevant parties to step up solidarity and cooperation and deepen the strategic partnerships between BRICS countries, seize the opportunities presented by the new round of industrial revolution and enrich our practical cooperation, improve global governance system while championing multilateralism, and enhance institutional building to promote the steady development of the BRICS cooperation. We believe that with the political guidance of the leaders of the BRICS countries, we will be able to make greater positive contributions to world peace and development and the building of a new type of international relations. We also hope that with the concerted efforts of various parties, this BRICS Summit will reap fruitful outcomes and achieve a full success. Q: Taiwan's Mainland Affairs Council Minister Chen Ming-tong is in Washington. He is going to speak at a think tank and meet some US senior officials from the administration. It appears to be the first "cabinet-level" official from Taiwan to visit the US. What is your response to that? Will China do anything if US officials meet with him? A: Our position on the issue of exchanges between the US and Taiwan remains clear and consistent. We firmly oppose official interactions between the US and Taiwan in any form and urge the US to abide by the one-China principle and the three joint communiques, prudently handle the Taiwan issue and uphold the larger picture of the China-US relations with concrete actions. Q: The third meeting of the 21st Century Panglong Conference concluded on July 16, with 14 points of agreement adopted as part of the Union Peace Accord. A statement of the conference was issued in which representatives pledged to hold at least three more meetings by the end of 2019 and reach agreement on all fundamental principles included in the accord. Myanmar State Counselor Aung San Suu Kyi said the meeting produced positive outcomes that are of vital importance to the fragile peace process. What is China's comment? A: China sends its congratulations to the successful conclusion of the third meeting of the 21st Century Panglong Conference in Myanmar and commends the efforts by all participating parties to arrive at consensus through active discussions and negotiations. We firmly support Myanmar in advancing its peace and reconciliation process that is comprehensive and inclusive, and will continue to provide support and assistance to Myanmar's peace and development endeavors in accordance with the will of all parties in Myanmar. 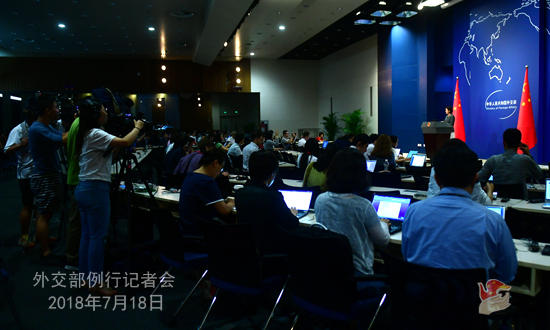 Q: Japan is going to describe Diaoyu Dao as part of its territory in textbooks for high school students. What is your response? A: Diaoyu Dao and its affiliated islands have been an inseparable part of the Chinese territory since the ancient times. 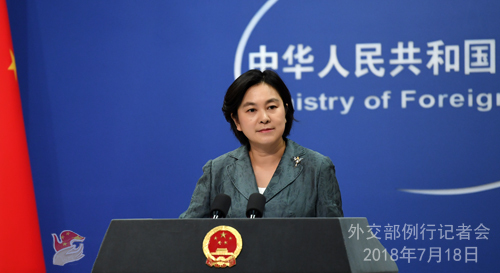 China's determination and resolve to safeguard its territorial sovereignty are unwavering. Whatever the Japanese side may say or do, it will never change the fact that Diaoyu Dao belongs to China. We urge the Japanese side to face up to the history and the reality, and educate its younger generations with a correct way of understanding history. Q: Australian Foreign Minister Julie Bishop said that China may be putting Pacific Island countries' economies into unsustainable debt. Australia's security agencies have opposed Huawei's participation in building the undersea cable in the Solomon Islands and its 5G network. What are your responses to these concerns? A: Regarding what you asked about the Australian Foreign Minister's remarks, it is nothing new. Some Australian officials and media have also made similar remarks and hyping-up. I would very much like to pose a question to these officials. Can they name one example with specific details as to where, when and how China caused unsustainable debt? Do they really think that they can simply count on using "maybe" to justify their groundless speculation, prejudgment and irresponsible accusations? Economic take-off and early stages of industrialization need to be supported by a large amount of capital. Our financing support in accordance with the recipient countries' wishes has met their urgent needs in a timely fashion. The relevant countries all approve and welcome the assistance China has offered to the best of its capability. In fact, many officials and media groups of the Pacific Island countries have publicly and forcefully refuted the wrong remarks of the Australian side. For example, Tonga's Minister of Justice said that it is pathetic that Australia accuses China of supporting these poor Pacific Island countries in dire need of help. Samoan Prime Minister said that the Australian official's remarks are quite insulting to the leaders of Pacific Island countries and will ruin friendly ties between Australian and the Pacific Island countries. Vanuatu's Daily Post carried an editorial saying that "the main difference between Beijing and Canberra is that Beijing listens. China listens to what Pacific leaders want. Often enough, it gives the most wanted help. Who benefits from these Chinese wharves? We the people of Vanuatu! The Australian side might need to hear from us. We live here". The editorial goes on saying that "the Australian side needs to think twice before speaking. It should stop throwing stones at China. It should first learn from its mistakes". I believe their words already make everything clear. We hope that the Australian side could correctly and objectively view China's relations with the Pacific Island countries and, with utmost sincerity, join our efforts to help the Pacific Island countries achieve sustainable development. You mentioned that the Australian security agencies opposed Huawei's participation in building undersea cable for the Solomon Islands and a domestic 5G mobile network for Australia. We are concerned about these reports. The Chinese government always encourages Chinese enterprises to follow market principles, international rules and local laws and regulations in their foreign investment and cooperation. We hope that the relevant party could observe the principles of objectivity and non-discrimination, level the playing field for Chinese enterprises' normal business activities, and contribute to realizing mutual benefit, instead of the contrary. Q: On July 13, the Democratic Republic of the Congo's Health Ministry issued an official statement, announcing an end to the latest outbreak of Ebola since May. What is your comment? Did China help the DRC in dealing with that? Can you give us more details? A: The announcement of the end to the latest outbreak of Ebola since May by the DRC's Health Ministry marks a major victory in its fight against the epidemic. We send our congratulations to them. Since the latest outbreak of the epidemic, we have taken the DRC's concerns as our own and immediately donated epidemic prevention supplies such as protective clothing, masks and gloves, and provided emergency humanitarian assistance to them. The Chinese medical team for prevention and control of the Ebola epidemic went to support the DRC's efforts in early June and has returned to China after their mission was successfully completed. China's assistance once again testifies to the brotherhood between China and the DRC as well as Africa, which has carried us through weal and woe. It also showcases that China and Africa are a community with a shared future. China's assistance is highly commended by the government and people of the DRC and the international community. Under the framework of the Forum on China-Africa Cooperation, China stands ready to help the DRC and other African countries to strengthen their public health and disease prevention and control systems and enhance capacity building so that they can better address the challenges of major communicable diseases.